Well, somehow I completely forgot that Mother’s Day was coming up, and I just realized that I hadn’t posted a single image for this year yet! I was pouring through my books last night to see what I could come up with for you guys, and found this charming image in a 1914 Children’s Book. 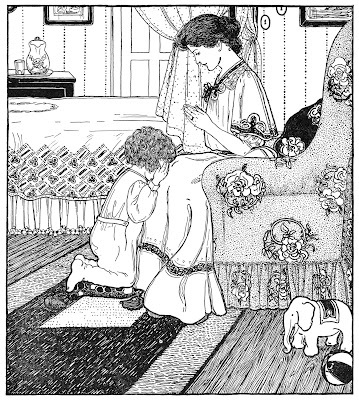 Shown are a Mother and Child saying prayers at Bedtime. So sweet! This is lovely the way it is, but it would be fun to color in too. I think it would make a lovely Handmade Card for Mom’s Special Day! 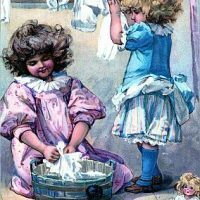 Instant Art Printable Download – Laundry Day Antique Butterfly Print – Natural History Public Domain Hammock Image – Cute! Oh, that truly is lovely! Thank you, I love this image! This is so very beautiful!! Thank you so much! Merci pour cette image pleine d’amour et de tendresse. This is a neat picture, but it looks to me as if the child is hiding his/her face. If you look closer it looks as if the child is kneeling on some objects. This used to be a form of punishment. Although I could just be looking at wrong. I think he’s (?) kneeling on a pillow; I see what looks like a tassel near his knee and one (harder to see) near his feet. I don’t know what to make of his hand covering his face… but the mother looks (to me) too serene to be disciplining the boy. thank you for all of the lovely vintage images that you share with us! I love this one!